My mother-in-law had asked me to make a dessert for our Christmas dinner and with so many things to do over the holidays, I wanted something without much fuss. I also wanted something kind of spectacular and festive looking. 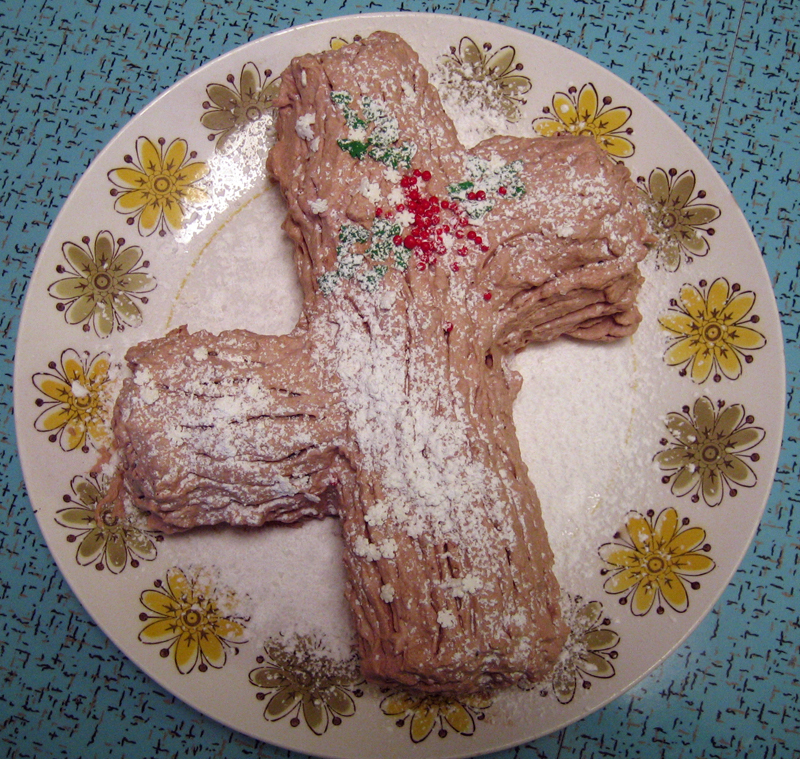 While so many bloggers have been whipping up complicated yule logs this month, I decided that I would make one too. 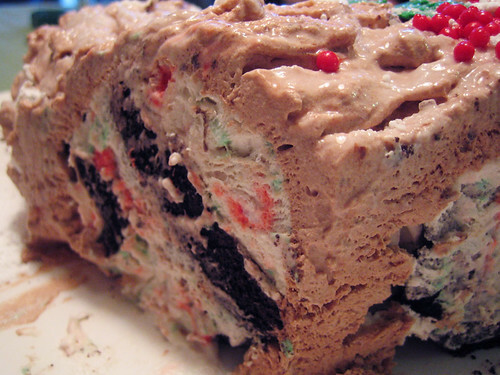 Thankfully, I saw this recipe over at Sew Darn Cute and decided that a candy cane icebox yule log cake would be the perfect holiday desert to end our Christmas meal. This cake was easy to put together, was light and fluffy, and the crushed candy canes made the dessert taste like Christmas. Plus, it has that retro 1950’s housewife feel that I just love. It was perfection in a log-shaped cake. I wish I had used gummy leaves and berries like the very beautiful original, but I just used Christmas cookie sprinkles for a festive decorative touch. I also used less sugar in the whipped cream mixture, figuring that crushed candy canes have enough sugar already. And a final tip…sprinkle icing sugar just before you serve, otherwise, the sugar will melt into the cake. This dessert was a hit and probably my most favorite thing about our meal. Enjoy! 1. Beat 1 1/2c. cream until soft peaks form. Add in 1 teaspoon sugar, peppermint and mint extracts, beating until stiff. Fold in crushed candy canes. 2. Cover a cookie sheet with parchment paper and assemble your stacks on it. Working quickly to prevent slippage, make 6 or so stacks of 6 wafers each, with 1 tablespoon of candy cane cream sandwiched between each wafer. Top 5 stacks with cream, leaving one stack plain with a wafer on top. If you find that things are sliding around too much, pop the cookie sheet in the freezer until things firm up a bit and then continue on. 3. Turn wafer stacks onto their sides and press them all together, leaving the plain-topped wafer stack at the end. Pop into freezer. After 1 hour, wrap the parchment paper around the “log” and freeze for another 5 hours or overnight. 4. Beat remaining 1 1/4 c. cream with 2-3 tablespoons of sugar and sift in the cocoa powder until stiff peaks form. 5. Trim two 3 inch wedges on the diagonal from the both ends of the log and set aside. Place the log on a serving plate and cover it with most of the cocoa cream, reserving about 1/2 cup. Press in the 2 stumpy ends along side of the log and then slather with the remaining cream. 6. Drag a fork all over the log to simulate tree bark, then freeze log for at least 4 hours. Let it sit at room temp for 15-20 minutes before serving. 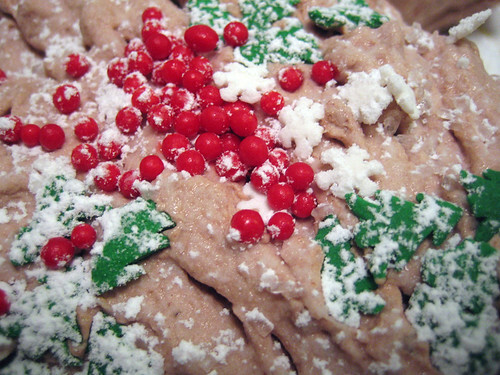 Decorate with candies and powdered sugar for a snowy effect. When cutting the cake, cut on the diagonal for a nice striped effect. This looks delightful. I agree – peppermint tastes like Christmas. I made peppermint marshmallows for our Christmas hot cocoa. Great yule log! I like the idea of using candy canes. This is a work of art. It looks like something you would buy at a high end bakery…Great work J!! I’m all exhausted from cooking and baking during this past week that I really do not have any interest in baking anything for New Year’s Eve or Day. If I do decided to whip up something at the last minute it might be some cookies – like your chocolate shortbread. lynn, it’s funny how a flavour can be associated with a certain time of year, but it’s true…peppermint is christmas! mmm, peppermint marshmallows sound delightful! thanks, jenn! happy new years to you! veggiegirl, i couldn’t agree more! Just wanted to add that this recipe is from Cook’s Country magazine and was published in December 2005. And it is delicious 🙂 🙂 🙂 I liked how your decorations turned out!